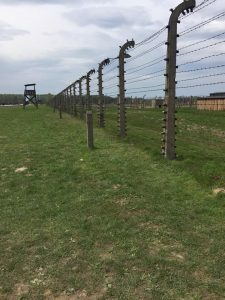 One of the reasons why we came to Poland in the spring of 2017 was to visit Auschwitz. I have been to Dachau outside of Munich about 12 years ago, but even so was unprepared for this visit. The first hurdle was getting a ticket to the site. The problem: it was the week of Yom HaShoah, and the day we wanted to go was the day when thousands would be participating in the annual March of the Living. Various tour operators were sold out or said the place was closed, so we tried to get tickets for the following days, and they were also all sold out. There are two ways to visit the place: one is by being part of a group tour, which is what the vast majority of people do. They take you from Krakow (usually), get you a guide that takes you around to the various exhibits and tells stories and answers your questions, and gets you back to your hotel. Two of the major tour operators — out of the dozens there are http://SeeKrakow.com and https://discovercracow.com. The other is as an individual. You have to make your own arrangements for the transportation to and from Krakow. 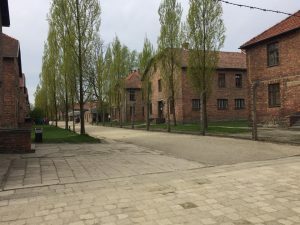 There are four public bus companies that run frequent service from the main bus station directly to Auschwitz, and it takes about 90 minutes. There is also a train, but the Auschwitz station is a bit of a walk. We took the bus. If you go this route, you save money (bus tickets are 12-15 zl. each way) and there is no entrance fee. But you have to get there early (say around 9 am), as they sell out quickly of the walk-in tickets. Once you get to Auschwitz, you can sign up for their own tours that the museum offers if you wish, there are a dozen each day in various languages, listed as you enter like an airport departure screen. For some reason, these tours are different than the public tours that the museum has listed on its website. I don’t know why. 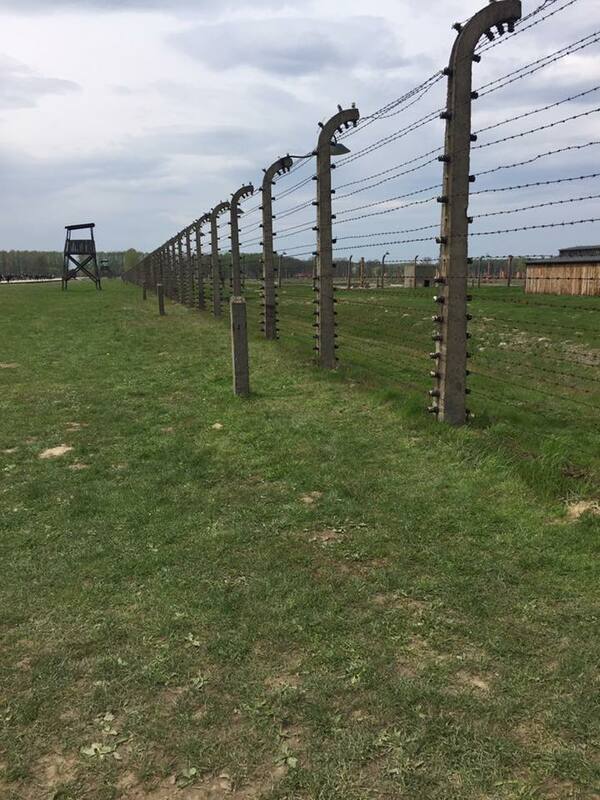 Also, when you visit you can go to two sites: the original Auschwitz site, where the tickets are required, and Birkenau, where you can literally walk in without any prior arrangement. Enough of the logistics. You can read this guide here which is very well researched, and offers more pro/con details. I mostly agree with the author’s recommendations. What you should know is that there are so many people walking around that it is easy to leave one tour and join another if you are there on your own. Which is what we did. One of the guides we met was the patriarch of an Orthodox Jewish family from NYC telling his stories to his grandchildren about his experiences. We stayed with them for a bit, as he has been to the camps numerous times and gives organized tours to Jewish groups quite often. You can check out his website here. At Dachau, there is some curation and exhibits, but mostly it is restored to what it would look like back during its use. You walk around and get a sense of what life was like back during the war. Everything is pretty much rebuilt, because the German officials in charge of that camp had time and the inclination to destroy most everything before the camp was liberated. I learned at Auschwitz that this was an individual decision: some officials were proud of their work and wanted to leave the place intact. At Auschwitz, much was destroyed. With the neighboring Birkenau camp (which is a couple of miles away), much was left alone. Even the buildings that were intact after the war are now long gone: they weren’t constructed to last. 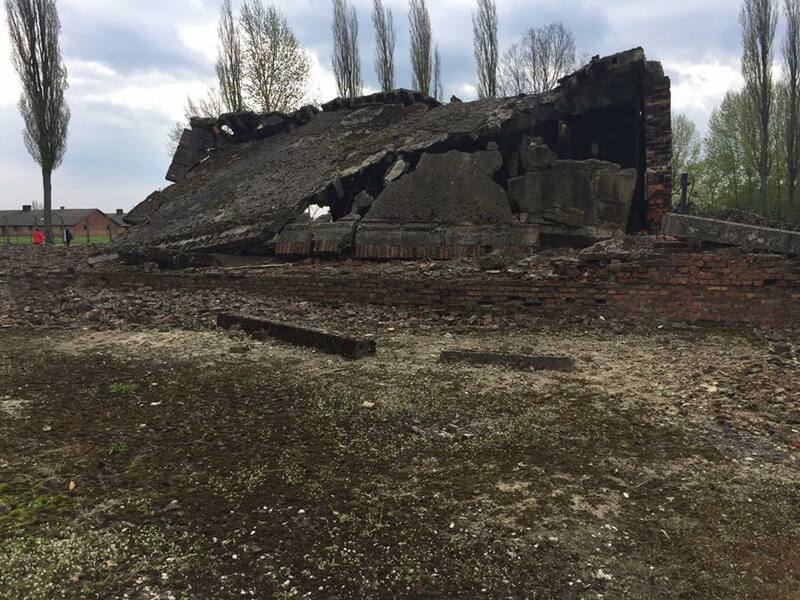 At Birkenau you got to see the foundations and the remnants of two stone chimneys that remained at each barracks site. One guide told us that these primitive heating systems — essentially a small firebox attached to the chimney — were placed there just for show. They never were lit. People froze in the winter and boiled in the summers. Ironically, like Ozymandius, the stone chimneys remain standing. Each barracks in the Auschwitz camp has been turned into a different museum exhibit, focusing on the particular national identity of the prisoners and the relief organization that was sponsoring the exhibit: so one hut might contain a memorial to the Dutch Jews, one to the Romanian Gypsies, one to the Poles, and so forth. Each exhibit is curated differently and some are designed simply, others are more elaborate. There is a lot to read, and I imagine that if you are with a group you don’t have much time to spend in each building, plus you spend a lot of time waiting to get in and out of the buildings as the place fills up. None of the buildings is set up in Auschwitz to show its original use: that is the case in Birkenau, where you can see how closely packed the inmates are housed, and how many barracks there are. It would take you probably 20 minutes to walk from one end to the other. If you want to read more from someone who does a better job describing the current state of the camps, check out what my colleague Shelly Palmer wrote in a post he did here in January. Perhaps the most infamous part of the camps were the crematoria. They have been demolished at Birkenau and have been reduced to a pile of rubble (as you see here), made all the more somber by the thought of what happened there. At Auschwitz (and Dachau) they have been reconstructed, so you have some understanding of what they looked like. In addition to these reconstructions, the most moving exhibit we saw on our visit was a temporary one about the crematoria were constructed, from a German engineering firm called Topf and Sons that still is in business today. I never really thought about this in engineering terms, and the problem they were faced with was that the gas chambers could kill more people than the Nazis could dispose of the bodies. These engineers developed higher-capacity crematoria. It was clear from the documents shown in this exhibit how complicit they were in this process and how cooperative they were in designing the ultimate killing machines used at the camps. In this brochure linked to this page above, you can see something interesting: The original engineering plans were unavailable for many years because the archives were purchased from a leading Holocaust denier. When he reviewed the plans, he eventually came around to accept the reality of what happened. Indeed, how anyone can deny that these events of the Holocaust took place is beyond me. The horrors of the place are made even more so because you are actually there. The crumbling structures make it feel even more intense. Every Israeli school kid goes on a field trip to Auschwitz as part of their education. I think this is a good idea: I wish it was a part of my own education too. This entry was posted in Poland by dstrom. Bookmark the permalink. Good read, thanks for sharing David. Amazing to read your posts as I have just come back from visiting Warsaw and my own grandfathers village of Rozan April 23-27. I have had the experience of finding the Jewish cemetery in Rozan (an amazing story that this place can even be found ) and visited sites that housed Jewish prisoners from the village. And where most likely my relatives were killed. Did you have a chance to visit the Jewish history museum of Warsaw ? This covers 1000 years of Jewish history in Poland and is one of the most thought provoking and truly amazing museums I’ve ever visited.